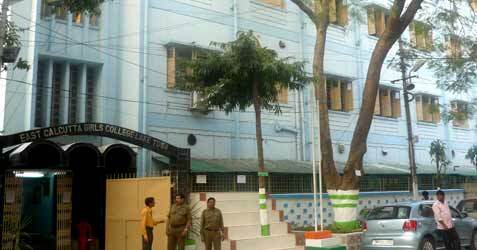 East Calcutta Girl's Collage Lake Town is the fruitful outcome of a long struggle of some local residents who are committed to provide appropriate facilities for Higher Education among girls.After establishing and running the Govt. Sponsored Girls' High School in Lake Town successfully for several years, the Managing Committee of the school, in order to fulfil its long cherished goal and the local demand for setting up a Girl's Collage for the higher education of women, took up the matter with the Education department of the Govt. of the West Bengal during the year 1978. Maenwhile a Society for Education, Health and Welfare was registered during the year 1981-82 with members comprising of eminent Educationists, Administrator, professionals, Retired Govt. Servants and industrialists. To expedite achievement of this noble objective, an Ad-hoc Committee was formed. Late Amiya Kumar Sen, the then Chief Secretary to the Goverment of West Bengal, became a member of the Ad-hoc Committee. With his initiative and active participation the committee pursued the matter in right earnest and convinced the Govt. about the necessity of the Girl's Collage in Lake Town. As be the request of the Ad-hoc committee the Govt. initiated Land Acquisition proceeding for aquiring a piece of land measuring about 2 acres lying contiguous to the school premises.In view of urgency of the matter, the Govt. approved starting of the Collage in the name of "EAST CALCUTTA GIRLS' COLLAGE, LAKE TOWN" in the exiting school building with effect of the academic session 1982-83.